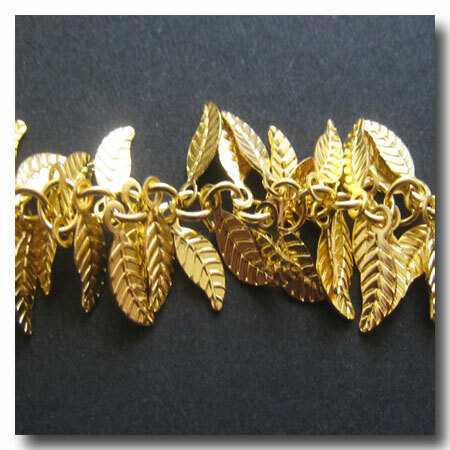 GOLD PLATE LEAF CHAIN. FINISH: Gold plate. BASE: Brass base. STYLE: Leaf charms dangle from chain links. WEIGHT: Medium. 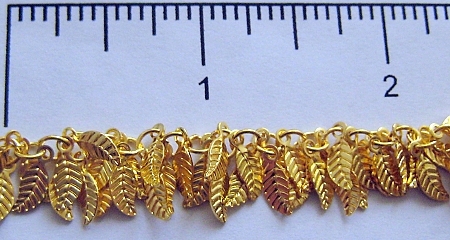 DIMENSIONS: Leaf charms approx. 8mm. Chain links approx. 3.5mm. Also AVAILABLE in: Silver Plate 1-329, Brushed SIlver Plate 1-332, Gunmetal 1-327, Antique Brass 1-330 and Antique Copper 1-331.